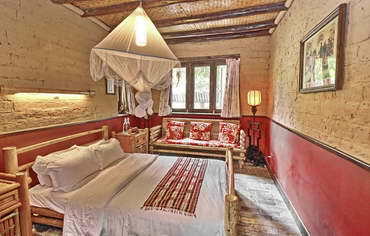 Comfort & romance on the upper floor of our restored mud-brick farmhouse. Traditional furnishings, vaulted ceilings, ensuite bath, A/C and heat. Beautiful traditional furnishings on the ground level of our restored mud-brick farmhouse. Quiet and cool in Summer, warm in Winter. Comfort, romance and rustic chic. Spacious with modern comforts on the ground floor of our restored farmhouse. Traditional beds, A/C, ensuite bath with changing area. Perfect budget getaway! 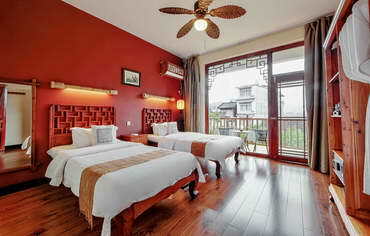 3rd floor room with private balcony and views of Moon Hill. This cozy family suite features one queen bed and two twin beds in an adjoining room with ensuite bath. 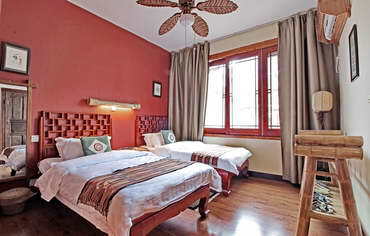 Views of Moon Hill from this cozy and bright queen room, perfect for a couple or solo traveler. Ensuite bath, blackout curtains, A/C and heat with 24-hr hot water. 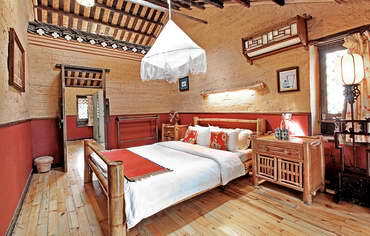 Views of Moon Hill Village from this cozy and bright queen room, perfect for a couple or solo traveler. Ensuite bath, blackout curtains, A/C, heat with 24-hr hot water. *With three nights or more direct booking. Holidays excluded. See details here. 9-time TripAdvisor's Traveler's Choice Award winner! Ranked among the top 10 China inns since 2008, Yangshuo Village Inn is located in the heart of Moon Hill village just 15 minutes from Yangshuo town. Our charming family-run Yangshuo guesthouse offer guests an authentic China countrysides experince with traditional decor, warm local hospitality and unforgettable rooftop dining. 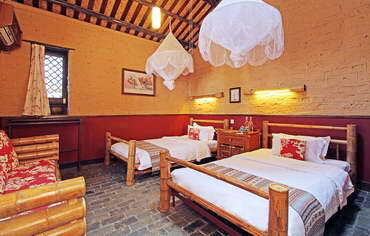 Yangshuo Village Inn remains one of the best values among Yangshuo hotels. Take your breakfast in the shady pomelo grove and walk to Moon Hill Scenic Area just across the road. 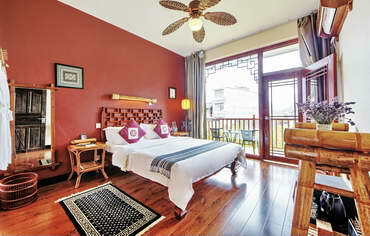 Our stylish yangshuo guesthouse offers complimentary Yangshuo travel services to help you make the most of your stay. Enjoy our simple and stylish comforts with the tailored service of a 5-star hotel. As you walk through the pomelo grove at our entrance, you know that you've found a very special place. A refuge from the chaos of China's cities and tourist hot spots, staffed by a friendly local village family. Gloria, Xiao Ying, Xiao Zhao and the others who serve you here, are long-time members of the Yangshuo Village Inn extended family. For the past 10 years, we've helped thousands of guests with inside recommendations on things to do around Yangshuo. We are close to caves, the Yulong River, Liu Sanjie, Moon Hill and other great attractions. At Yangshuo Village Inn, we believe in the importance of localism, and welcome you as a temporary member of our community. The stunning scenery on this liesurely float down the Yulong River is a must-experience for our guests. Stop for lunch or dinner at our sister hotel. This spectacular performance on the Li River from famed director Zhang Yimou has been wowing audiences for 10 years with a combination of breathtaking lighting, music and choreography. 20 minutes by bike on the Yulong River, Yangshuo Mountain Retreat offers the best outdoor dining in Yangshuo and is also a 9-time TripAdvisor Traveler’s Choice winner.